Babies have needed to be carried for as long as parents have needed to go places, and different cultures have devised ingenious methods to ease the burden of bearing the weight of a small child on long, or even short, walks. Many Native Americans used a cradleboard, a highly decorated board covered in cloth in which the baby could be secured, typically by laces running across the cloth. The cradleboard was then strapped to the carrier's back. Members of other cultures carried, or sometimes still carry, children wrapped in shawls, slings, or strips of cloth tied around the carrier's shoulders, neck, or hip. The adult Inuits of northern Canada often carry children in the large, furry hoods of their caribou-skin parkas. The Papuans of Papua New Guinea carry their children in nets woven from string made from the inner bark of trees. The net hangs from the carrier's head and the baby nestles against the carrier's chest. This allows nursing mothers to feed their children as they carry them. An even less strenuous method of carrying small children came about in England in the 1700s, when the first baby carriage was introduced. The first baby carriages, designed to be pulled by dogs or Shetland ponies, were large and bulky. Naturally, the design has been streamlined over the past three centuries. Today, many varieties of baby carriages, or strollers, are available, from models that allow the child to lie down to those that keep the child upright. The invention has become more versatile as well, with collapsible versions, models that convert into car seats, and small trailer-like models, called prams, that can be pulled behind bicycles, as well as pushed. Prams are popular with bicyclists and joggers and can carry more than one child, as well. A study conducted by Henry Ford Hospital in Detroit, Michigan, showed that jogging with a pram or stroller increased runners' heart rates by 3-5% over those jogging without strollers. The stroller also helped runners increase oxygen consumption by 2%. Women burned between 4-21 extra calories per 30-minute jog and men burned between 4-41 calories, depending on the make of the stroller. English architect William Kent introduced the first baby carriage in 1733. Designed for the child of the third Duke of Devonshire, the carriage was shaped like a shell and was intended to be pulled by a dog or a Shetland pony. Over the years, the idea caught on for children not born of royalty, although a human-powered baby carriage was not developed in the United States until Charles Burton came up with the idea in 1848. Pedestrians, in America at least, did not take kindly to Burton's invention at first as inexperienced operators tended to run into them. Burton left such troubles behind, however, and moved to London where he continued to build baby carriages. Burton acquired a royalty-studded clientele overseas, designing baby carriages for Queen Victoria, Queen Isabel of Spain, and the Pasha of Egypt. Improving upon Kent's and Burton's designs, Parisian E. Baumann devised the first collapsible baby carriage in 1906 after recognizing the difficulties in storing earlier models in cramped lodgings. Baumann dubbed his invention "The Dream." Baby strollers come in many varieties and are typically manufactured on an assembly line. The primary materials used in manufacturing a baby stroller are aluminum or steel for the frame, cloth for the seat and/or hood and rubber and plastic for handles and wheels. The first pram appeared in Landau, Germany, just after World War I. The four-wheeled carriage featured two facing seats placed parallel to the axles and also included a hood that could be replaced by a sunshade in hot weather. Other accessories that became available included a mosquito net, an adjustable umbrella stand, and a spare wheel. Today's prams are highly modernized and meet the needs of an active society. Most are equipped with small bicycle-type wheels and are aerodynamic. A three-wheeled version shaped like a needle-nosed race car is popular with joggers, while a small carriage-type unit can be attached to the bicycle, allowing cyclists to spend time with the kids and exercise at the same time. 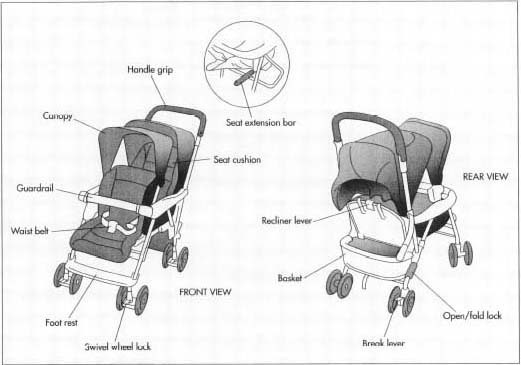 The primary materials used in manufacturing a baby stroller are aluminum or steel for the frame, cloth for the seat and/or hood and rubber and plastic for handles and wheels. 1 Steel or aluminum tubing is bent, using a press, to form the components of the frame. 2 The metal frame components are then dipped into an antioxidizing solution that prevents rusting and also helps the paint adhere to the frame. 3 The frame components are spray-painted using a process known as powder-coating (this is the same process by which automobiles are painted). A powder-coating apparatus works like a large spray-painter, dispersing paint through a pressurized system evenly across the metal frame. 4 The frame components are pre-heated then coated with a powder resin finish. 5 The components are heated again to bake the finish onto the frame. 6 The various components of the frame are assembled using rivets, screws and/or bolts. 7 The seat and hood are cut from a large swath of material with an overhead cutting apparatus known as a cutting die. The die can cut 10-20 pieces at one time. 8 The seat and hood are stitched together on a large, mechanical sewing machine. 9 Trim is stitched onto the seat and hood, again using a large, mechanical sewing machine. 10 The seat and hood are attached to the assembled frame. 11 The wheels are attached to the assembled frame. 12 The final products are placed in polybags (plastic bags) and boxed for shipping. Because the baby stroller must be safe for a small child to ride in, it is subject to strict quality control regulations. All baby strollers produced in the United States must meet American Society for Testing and Materials standard number 833-97. The components of the stroller are inspected by the supplier and certified as meeting the ASTM standards before being shipped to the manufacturer. Americans are as active as ever and innovations in the stroller have contributed to such activity. Joggers, bicyclists, and casual walkers can all bring the kids along in different forms of prams and it is anticipated that future models will continue to be developed to meet the needs of the public, just as they have for the past three centuries. Bernhard, Emery and Durga. A Ride on Mother's Back: A Day of Baby Carrying around the World. San Diego: Harcourt Brace & Company, 1996. Travers, Bridget, ed. World of Invention. Detroit: Gale Research Inc., 1994. Creager, Ellen. "Rolling and Strolling the Distance." Detroit Free Press, May 12, 1998, pp. 13-14F. typically, the first stroller was not designed for limited spaced storage. it must have been massive!